In 1971 Philip Guston was awarded a residency at the American Academy in Rome, his acceptance brought him back to Europe for his third stay. It was in Rome at the American Academy that Guston met and befriended fellow artist John Wenger. By Wenger's account both painters traveled across Italy several times with a driver and guides in search of obscure and well-known images by Piero della Francesca and other Renaissance masters. On a visit to Siena, Guston procured a very long ladder to assist in getting a closer look at the faces of political dignitaries illustrated in Lorenzetti's large scale mural titled Allegory of Good and Bad Government. Wenger stayed below, feeding twenty dollars' worth of Lire coin into the lighting fee box to keep the faces illuminated. Other sojourns took the two painters deep into Etruscan tombs and shopping quests for giant balls of string and huge boxes of rubber bands. 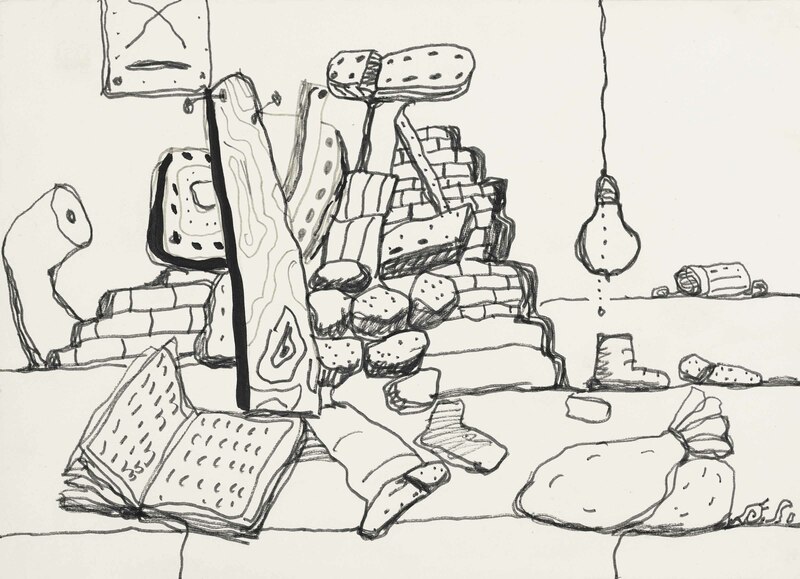 Wenger's accounts of his shared time with Guston in Italy bring to mind the images and symbolism familiar in Gustons ink drawings of the period as in the incredible Untitled work gifted by Guston to Wenger.